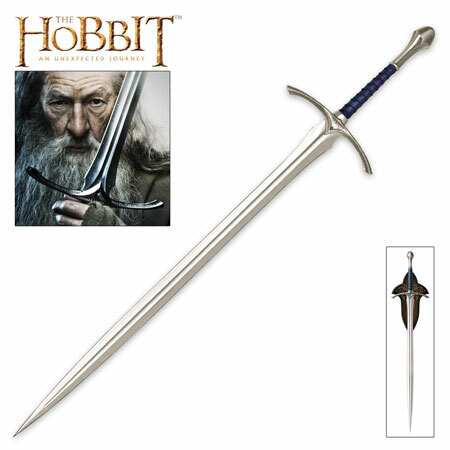 Glamdring Swords for sale are the officially licensed sword from the Hobbit movie. Made by United Cutlery these are meticulously manufactured reproductions of the real swords used in the award-winning movie adaptations of JRR Tolkien’s classic works, the Lord of the Rings and The Hobbit. Glamdring Swords are a massive 47 5/8th inches overall. They feature a 35 ¼ inch, stainless steel blade. The hilt is manufactured of solid metal. This Glamdring Sword is modeled after the real sword wielded by Gandalf in the movie the Hobbit. The design of the sword is based on the real film prop made by Weta Workshop of New Zealand. These swords include a Certificate of Authenticity and a wooden wall display plaque, which contains mounting hardware and directions. These are the officially licensed United Cutlery movie swords from the Lord of the Rings and the Hobbit Movies, a magnificent addition to any Lord of the Rings memorabilia collection. Buy these Glamdring Swords, the sword of Gandalf for $239.99.